Warning to Russian Tourists: Skip Athos This Year! However, I did want to give at least a quantum of closure to the Autocephaly story. The Russian Church Synod reacted surprisingly firmly yesterday (a lot of people thought they would be too chicken to go that far, but they did, so bravo to them! ), so there was a complete split with Constantinople, and a declaring of the latter to be “Raskolniki“, aka Splitters. From the Russian POV, Constantinople is now Churcha Non Grata. 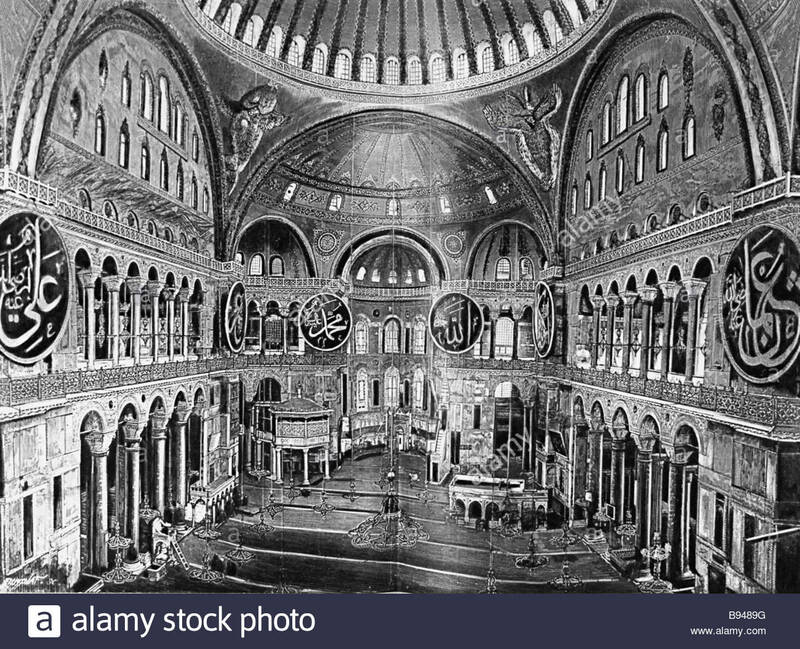 Believers of the True (=Canonical) Orthodox Faith are informed they are not to pray or take communion in any Churches under the jurisdiction of the Constantinople Patriarch, Bartholomew. Good to know. Being an atheist, raised in a sovok-type family, I never set foot in a church anyhow, nor took communion. But were I ever to do that (highly dubious), it certainly wouldn’t be in Constantinople! Not so long as that Banderite-loving SOB is in charge, so there! 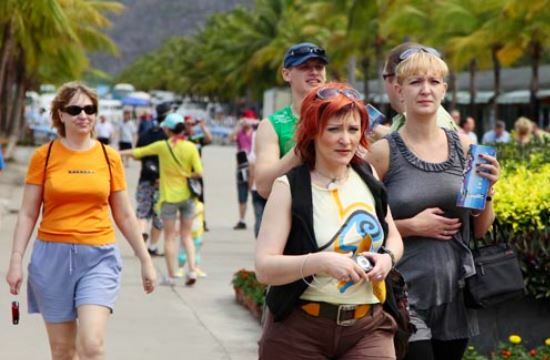 In 2017 Greece was the second most popular destination for Russian tourists. If any member of the priesthood violates above rules, then he would be subject to прещение, which is defined as a traditional form of disciplinary punishment employed in Russian churches. The punishment ranges from a slap on the wrist, to a demotion, to full-blown Anathema. But what about the lay persons? What would be their punishment if they disobeyed Archbishop Igor? “Repentance in the confessional” [do Orthodox have a confessional like Catholics? I didn’t even know that…] for disobeying the Church,” Igor elucidates. But What About The Grace-Giving Fire? People who have been through a divorce know what it’s like that “day after” the fateful words are spoken. That’s when people ponder and start tallying up their losses. Like, who gets the dog. How am I going to feed myself? etc etc. Similarly, in this “divorce” between Russia and Constantinople, which only happened yesterday, the Russian side in particular is coming to grips with what it lost in this process. Not that there are regrets: It had to be done. But one cannot paste on a happy face and just pretend there are no negative consequences. So, I have this other piece, also by Alina Nazarova, which concerns the Grace-Giving Fire. Apparently there is this Fire, sort of the mystical version of the Olympic Flame. It’s a Miracle-Flame that never goes out, no matter how many fire extinguishers you spray it with! This flame normally resides in Jerusalem, but every Easter it is brought to Russia. People were worried that the split with Constantinople will affect this. But Moscow Patriarch Kirill’s Press Secretary Alexander Volkov reassures believers that the fire will arrive on schedule. Since it travels directly from Jerusalem, it will not be affected by the Schism. But now we get to the Elephant in the room: Mount Athos. 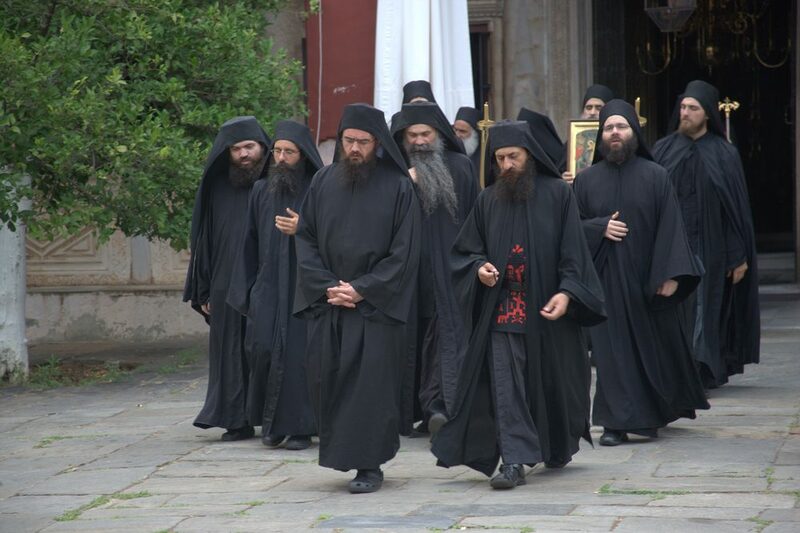 Of all the things that the Russian Church is sacrificing, and the price that it has to pay for its principled decision: Barring believers from making the pilgrimage to Mount Athos is perhaps the most painful of all. See, Athos was the one glorious ace in Bartholomew’s deck of cards. He boldly played it … and the Russian Church boldly called his bluff. And yet with open eyes, knowing that this loss will be painful for them. When asked about this specifically, Igor confirmed that, yes, the Russian Church Synod has forbidden believers of the canonical church to go to Mount Athos. At all. Not even as tourists. Not that the place even welcomes tourists. I have this wiki entry which explains how this thing works. Athos is the Eastern Orthodox equivalent of the Vatican. It is an independent polity within the Greek Republic, subject to its own laws, and home to 20 monasteries. All of which are under the direct jurisdiction of Schismatic Patriarch Bartholomew. wiki: “Mount Athos is commonly referred to in Greek as the “Holy Mountain” (Ἅγιον Ὄρος Hágion Óros) and the entity as the “Athonite State” (Αθωνική Πολιτεία, Athoniki Politia). Other languages of Orthodox tradition also use names translating to “Holy Mountain” (e.g. Bulgarian and Serbian Света гора Sveta gora, Russian Святая гора Svyatya gora, Georgian მთაწმინდა). In the classical era, while the mountain was called Athos, the peninsula was known as Acté or Akté (Ἀκτή). In conclusion: Mount Athos: This was NATO’s ace card, and they played it well! Gotta give credit to the enemy, when he makes a clever play. NATO and the Banderites thought to force Russia into Zugzwang. However, the Russian Church responded also with a clever (and highly principled) if forced move. Now we wait to see what happens next! This entry was posted in Religion and tagged Alexander Volkov, Archbishop Igor Yakimchuk, Mount Athos. Bookmark the permalink. 15 Responses to Warning to Russian Tourists: Skip Athos This Year! If we didn’t have confession we might as well be Anglicans. So…. you get in a booth and tell the priest all your dirty little secrets…? There’s no booth (these days the RCC probably only uses theirs for anonymous hookups) – just a little space next to the altar doors. Sometimes I write down whatever I have to confess on a piece of paper (such as associating with heathens like yourself). The priest rips it up after he has finished imparting his wisdom, puts a cloth over my head, and says a prayer on my behalf. 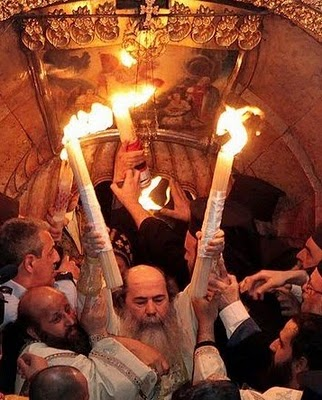 The worry about the Holy Fire wasn’t a travel issue, it was about who first gets it from inside the tomb. Many people thought it was the Patriarch of Constantinople (since he is the “main” patriarch”) but in fact it is the Patriarch of Jerusalem (since the Holy Fire is in Jerusalem). So no problem in lighting torches/candles from the initial torch. Right, so the holy fire bypasses Bart. As well it should. Let the games begin! The Turkish Orthodox Church is not a recognized church. Ironically, it is like the “alternate” Ukrainian Church before it was granted autocephaly. Thanks for link, anyhow, Nicola, and still sounds like a great lawsuit. Plus, we get to know Bart’s real name, Dmitrios Arhondonis! One reason why this story is so hard to follow, all the players have multiple aliases, just like Al Capone’s gang members. Any time now I am expecting to read that one of these patriarchs or exarchs has an aka of “Lefty” or “Queer Eye”, or something like that. The reason for the names is that all Orthodox bishops are also monks. Most of the time, people chosen to be bishops were monks already, but if not, they are tonsured as monks as part of the process of becoming a bishop. The thing is, part of the process of becoming a monk is taking a new name. The new name is meant to reinforce the idea that a monk “dies to the world”. So Joe Blow is now dead, while Dmitrios Blow begins a new life in the monastery (or as the bishop, as the case may be). I believe occasionally monks who become bishops sometimes take a new name again, which makes things more complicated. Father Dmitrios Blow — I like that! Oi – don’t agree with your comparison of the priests with commies, though. Aside from the superficial resemblance in having aliases, totally different thing, Ryan! The reason the commies needed aliases is because they were wanted by the Tsarist police. Either that, or they needed to tone down their Jewishness. Still, I get your point, and my comparison with Al Capone’s gang was somewhat tongue in cheek.